Taradale is nestled in a picturesque valley of cleared farming land surrounded by native forests and dominated by the 1862 Taradale viaduct. 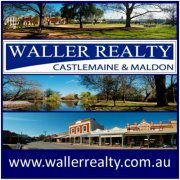 A former gold rush town and pit stop on the Old Calder Highway Taradale has a significant built historic legacy as well as the advantages of an idyllic and valuable environment. It is a vital community committed to pursuing a progressive and dynamic future for the town whilst respecting and appreciating the legacy townspeople are privileged to enjoy. No matter the season, when you sit on the front verandah of this home having a quiet early morning coffee you will fully appreciate the peace and tranquility of this place and understand why townsfolk feel privileged to live here. 1. Taradale is a vibrant rural hamlet which is home to a small but dynamic community of farmers, entrepreneurs, business people, artists, writers, tree changers, commuters, retirees. It is made up of every kind of family whose diverse interests are reflected in the broad range of facilities, activities and community events available to visitors and locals. 3. Taradale has a rich history. You’ll love waking up here every day to country sounds. You’ll feel part of the rich tapestry of the past that can be experienced in this region. 8. There is support here from womb to tomb. You have all the health services you need.